Cancer is a dreaded word in any language. This life-destroying disease has plagued our lives and our bodies for long enough. Now more than ever, incredible research and groundbreaking developments are shedding more light on how we can finally beat The Big C. One study in particular is putting cancer cells to the test by literally cooking them into non-existence. Using a new tool called a nano thermometer, scientists are now able to read temperatures of cells with precise accuracy. With the help of nano diamonds, tiny diamond particles, cells are being evaluated and explored beyond anything anyone has seen to date. You see, diamonds do not chemically react with or affect cells, like chemotherapy does, for example. When laser-light is emitted through the particles, the light can be measured and give researchers a precise temperature of the diamond and its surroundings. This process will allow scientists to explore developments and growth progression by reading cell temperature levels, all without disturbing them. With the help of the nano tools and lasers, cancer cells can then be heated to a critical temperature and killed. More exciting news states that healthy cells are all but left alone and unharmed in the “cooking” process. These revolutionary developments could even one day overtake chemotherapy and radiation therapies.This vital research on the processes within cells can lead to new ways of identifying diseases, and hopefully curing them. There are several reasons why one may choose to purchase Cubic Zirconia (CZ) over the traditional diamond or other precious gems or metals. Yet there are still some people skeptical about this wonderful alternative, especially when looking at fine jewelry such as engagement rings, earrings, or necklaces. There are many advantages to choosing CZ that these people should be aware of before dismissing this alternative gemstone. One of the advantages that many already know about is that CZ is usually more affordable than diamonds or other gemstones that are commonly used within fine jewelry pieces. This is a man-made product, which is why it is less expensive than the natural occurring diamond or gemstone. Another advantage of CZ is that because it is man-made those who manufacture it can ensure consumers less imperfections inside or on the surface of this makeshift gem. 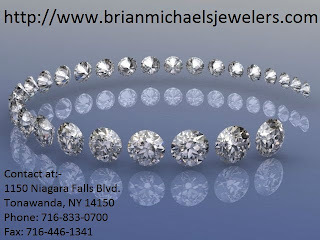 Jewelers can also manufacture CZ to be more colorless, which is usually the staple of a high quality diamond. Lastly, diamonds are often shaped by the earthly processes of high pressure and high heat underneath the Earth’s crust, which can cause several imperfections including oddly shaped stones. With CZ this does not happen, you will get the shape you purchase! Many people dismiss CZ because it is not the traditional diamond, but this would be a mistake. Those looking for a more affordable option, as well as less inclusions and a more colorless gem, should look into the discovery that is CZ! What better way to claim “I am titanium” than to bedeck yourself with titanium jewelry? Titanium is one of the most modern metals to be used in fine jewelry. Be different and explore this lightweight luxury. Titanium is growing in popularity due to being light weight, strong, corrosion resistant, scratch-resistant and 100% hypoallergenic. The most popular form of titanium jewelry is in the form of a ring, but dog tags, bracelets, cufflinks, earrings, money clips, necklaces and a whole array of other jewelry can also be made of titanium. Ring styles include classic oval, mokume-gane or wood grain appearance, sable or soft silk appearance and frost or frozen appearance. Gemstones and different types of inlays can also be applied to titanium rings, creating stunning details. Titanium brings a unique elegance to your jewelry, while remaining affordable. It is a harder metal than gold and rather difficult to work with. Be aware that there are many different grades of titanium, which will make a difference in the quality of your jewelry. Two distinct categories include commercially pure and chemically pure. Commercially pure has categories 1 through 4, from softest to hardest, and can be used in jewelry applications, while chemically pure is more often used in medical applications. Standard jewelry-making techniques such as rolling or soldering cannot be used on titanium but some jewelers have adopted new techniques, specifically to offer this fashionable metal jewelry. The beauty of the finished product, therefore, really reflects the craftsmanship behind the piece. The Jeweler’s Loupe: What is it? The jeweler’s loupe is a special tool that all jewelers use. This gadget allows them to examine a piece through high powered magnification. Loupes are also frequently referred to as hand lenses in a general sense, and there are many different categories of loupes. Jewelers usually use loupes that have a handle, which helps in focusing on very fine and small pieces of jewelry. Monocular is the standard for the industry, as opposed to a binocular structure which would require both eyes. These are the standard tools used in the grading of gemstone clarity inclusions and imperfections visible at 10x magnification have an impact on the overall quality and grading of the gem. Watch making uses another type of loupe and one can easily imagine why. The mechanical workings of a watch are so small it would take a high powered loupe to even begin getting a good look at them, let alone how helpful they are when you need to actually start manipulating the internal workings of the watch in order to repair and replace parts. The jeweler’s loupe is a hugelyimportant tool in the industry, and remains a requirement for anyone trying to get a decent read on any jewelry piece.